Flea and ticks in pets is something pet owners are always worried about. In addition to extreme discomfort, flea infestation in dogs can also cause serious health problems in dogs and puppies. 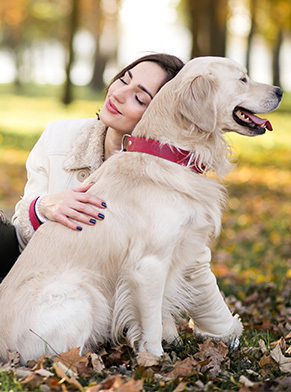 Now provide protection against fleas and ticks in pets with Bravecto! Bravecto is the first oral chewable tablets for dogs. This flea medicine provides up to 12 weeks of protection against fleas and ticks. One tablet provides broad-spectrum and long-lasting protection that starts to kill fleas. This tasty, chewable tablet starts working within 2 hours. Bravecto also protects dogs against four different tick species: black-legged tick, American dog tick, brown dog tick, and lone star tick. It provides relief from flea symptoms in dogs. This veterinary medication eliminates current flea infestations and prevent new ones from developing for 12 weeks. With one dose, Bravecto is easier to give and less to worry about for you! 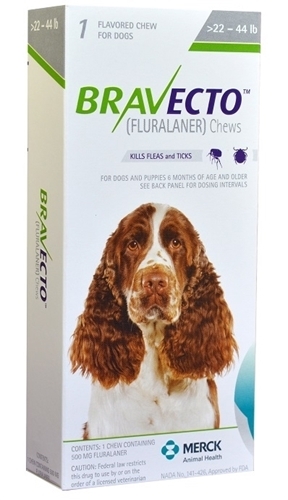 Buy Bravecto flea control chewable tablets from our online veterinary pharmacy based in Texas. We care for your pets and offer best quality veterinary prescription drugs at our online pet pharmacy. This flea medicine is meant for dogs and puppies that are over 4.4 lbs and 6 months of age or older. With one dose, Bravecto provides effective prevention and treatment for both fleas and ticks in dogs and puppies for up to 12 weeks. Just 4 dose of Bravecto offers a full year of protection. No more monthly dosing! No messy issues and no need to isolate your dogs and puppies from children or other pets after flea control treatment. Fewer doses mean less chance to miss a dose, thus reducing the likelihood of having gaps in protection. Most dogs love the taste of these chewable tablets. As soon as Bravecto is given to a dog or puppy, the pet medication quickly reaches tissue fluids under your pet’s skin. As soon as fleas and ticks start feeding on your pet, they ingest Bravecto and die. Bravecto kills fleas, prevents flea infestations in dogs and kills ticks for 12 weeks. Keep this and all veterinary drugs out of the reach of children. Keep the flea treatment tablets in the original packaging until use. Bravecto can be used in adult dogs, and it’s even safe for use in breeding, pregnant, and lactating dogs. For use in growing puppies, they should be 6 months of age or older and weigh at least 4.4 lbs. Treatment with Bravecto may begin at any time of the year and can continue year-round without interruption. Bravecto flea medicine for dogs can be given to your dog any time of the day, however it is recommended that you give your dog Bravecto at a mealtime, with food. Do not use this flea medication for cats and horses. Do not store these chewable tablets for flea infestation in dogs and puppies above 86°F (30°C). Based on my personal experience I can say Aapex pet pharmacy is the best place to get compounded medications for pets. It was really hard to find the prescribed medicines in the market but they made it available on time.